Governments need quantitative assessments of the outcomes of proposed investments so they can weigh the merits of each option. Without these, there is a risk that some proposed changes could in fact reduce rather than increase benefits to the economy and society. At present, there is no definitive framework for assessing the returns to Northern Kenya's predominantly pastoralist land use, nor any prediction of its returns under anticipated climate changes. There is therefore no possibility of comparing returns between this and any alternatives. Flagship projects planned to accelerate economic development in Northern Kenya include an international transport corridor, a resort city and an international airport. In addition, mineral deposits are being discovered, towns are growing across both arid and semi-arid areas, and land speculation is increasing. The county governments are faced with the task of prioritising investments which can do the most to improve living standards for local people. This paper is intended to stimulate and contribute to a discussion of how the returns on land-based investments in the drylands should be evaluated. It presents an assessment framework for weighing the total economic value of the ecosystem services provided by pastoral and mixed land-use systems under anticipated climate changes and variability. 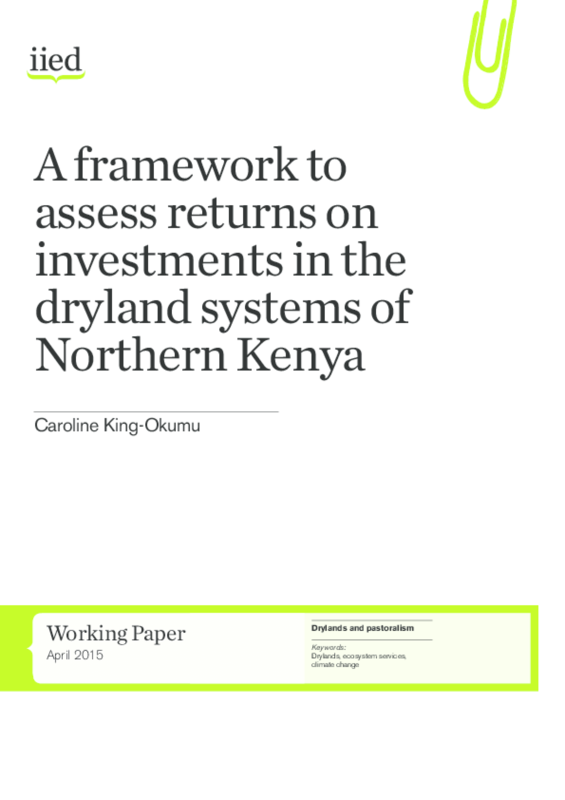 The proposed framework draws on contributions from previous research at IIED and by other research partners focusing on ecosystem service assessment in Northern Kenya and surrounding dry regions. The paper reviews the current state of knowledge on the returns from pastoral and other land uses in the region, identifies research gaps and highlights the next steps needed for implementing the framework.